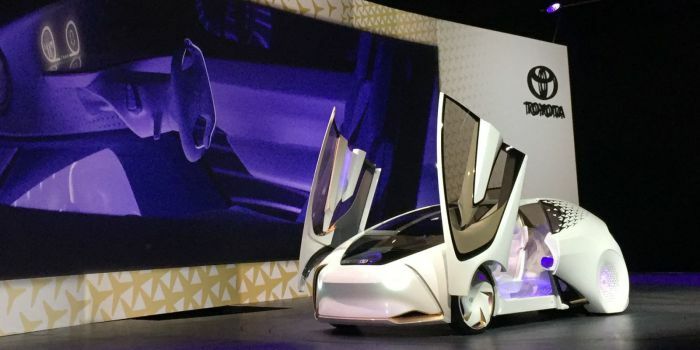 I do agree with Shelly’s wisdom that the Mercedes concept van “sums up all the technologies that are on display at CES this year in one neat package. It’s autonomous, it delivers on-demand and it uses machine learning to accomplish its tasks.” However, the operative word from a robotics standpoint is “concept,” as realists we are more excited by kick-the-tires demos like the NVIDIA one below. Standing on the windy parking lot track, I personally witnessed (and captured) three adventurous technology executives hand over their lives to NVIDIA’s AI chip. To me, this demo sums up the CES 2017 experience best – humans are ready to give the keys to the machines. NVIDIA, a graphics chip company that is probably best known for gaming, has leveraged its knowledge base to develop new computer vision deep learning microprocessors to grow its marketshare beyond gaming to AI and connected cars. The company has been rewarded handsomely on Wall Street with its stock value booming 230% this past year. 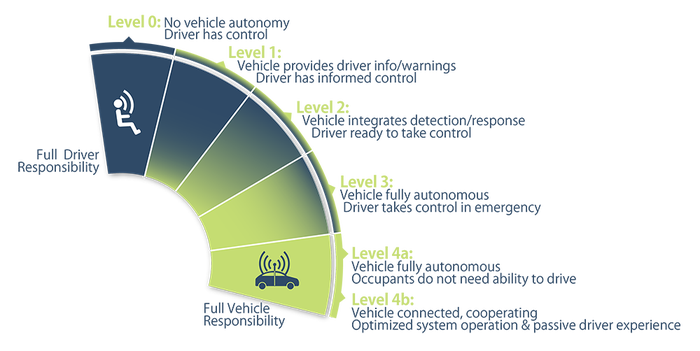 NVIDIA is just one of many examples that has driven the growth of the Autonomous Vehicle Marketplace at CES by over 75% since its inception in 2014. 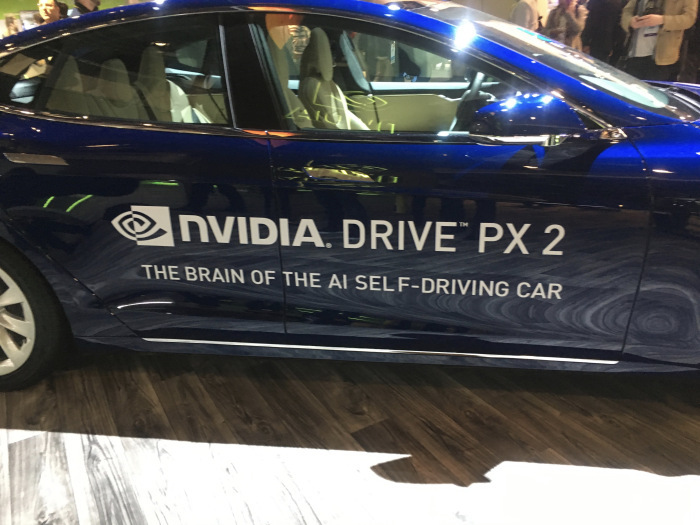 Huang, partnered with Audi, unveiled NVIDIA’s new computing driving technology, Xavier, that runs its own Driveworks operating system. The processing unit contains eight ARM64 cores and boasts performance of 30 trillion operations per second. According to Huang, “these AI connected cars should be able to drive from address to address in nearly every part of the world.” Recognizing the shortcoming of present learning structures, Huang declared that Driveworks can also work out when it has low confidence in its self-driving ability to handoff driving to the human co-pilot. According to Pratt, “TRI has been taking a two-track approach, simultaneously developing a system we call Guardian, designed to make human driving safer…while working on L4 and 5 systems that we call Chauffeur. The perception and planning software in Guardian and Chauffeur are basically the same. The difference is that Guardian only engages when needed, while Chauffeur is engaged all of the time during an autonomous drive. 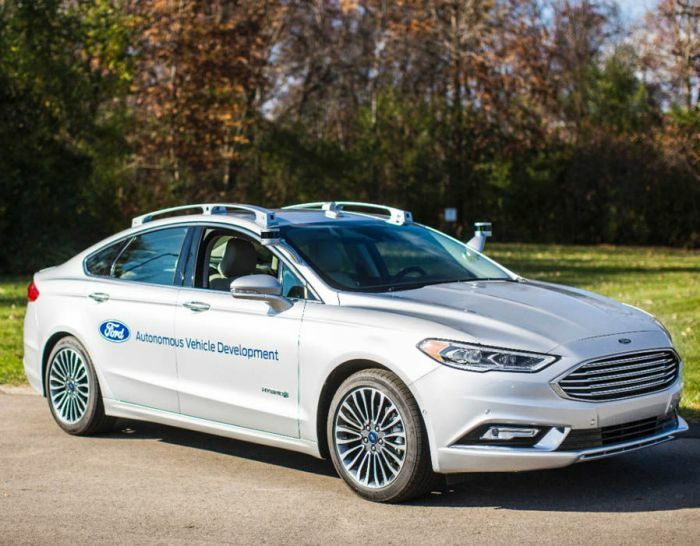 In Guardian, the driver is meant to be in control of the car at all times except in those cases where Guardian anticipates or identifies a pending incident and briefly employs a corrective response.” In a sense, Toyota is skipping NVIDIA’s and Tesla’s auto-pilot controls and going from Level 1 to full autonomy. But when will this be available? Virtual Reality is last year’s drone fad: It appeared that every space formerly occupied by hobby drone companies has been filled this year by Oculus or Samsung Gear knockoffs (even the Verge got into the act by handing out pink cardboard VR headsets at JFK for flights bound for Vegas). 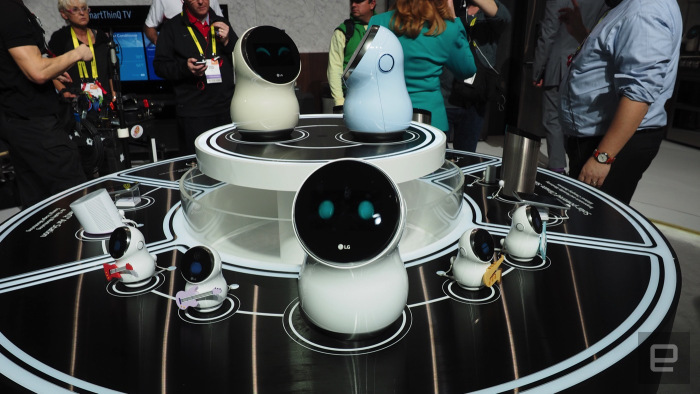 EVE Robot is the new Alexa: As predicted, the age of social robots is here; in fact, it started with Siri however what I didn’t anticipate is that all of the industrial designers would watch the same Pixar film (see LG examples above). While physically adorable, the value proposition has yet to be fully fleshed out as most offerings are just better packaging of Alexa. To all my fellow CES attendees, see you next year… to all those that stayed home, now do you have FoMA? Previous The Best Way to Fix Politics? Hack it. Next The 12 Startups in Entrepreneurs Roundtable’s Winter 2017 Class Have Been Unveiled!